The preliminary employment numbers are just now in from the Bureau of Labor Statistics, and they show Louisiana added 30,800 jobs for the 12 month period ending October 2013. Employment in Louisiana for the 12 months ending October 2013 grew from 1,935,700 to 1,966,500. The table below shows the states with statistically significant employment changes, seasonally adjusted. In October, the West continued to have the highest regional unemployment rate, 7.8 percent, while the South had the lowest rate, 6.9 percent. 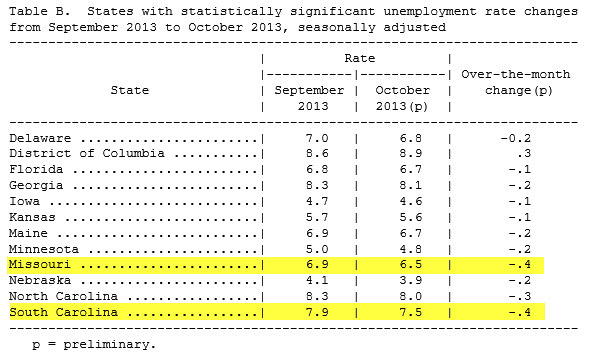 Over the month, only the South had a statistically significant unemployment rate change (-0.1 percentage point). Significant over-the-year rate changes occurred in three regions: the West (-1.1 percentage points) and Northeast and South (-0.6 point each). the West North Central (-0.3 percentage point) and South Atlantic (-0.2 point). Three divisions had significant rate changes from a year earlier: the Pacific (-1.3 percentage points), South Atlantic (-1.0 point), and Middle Atlantic (-0.7 point). appreciably different from that of the nation. Eleven states had statistically significant over-the-month unemployment rate decreases in October, the largest of which occurred in Missouri and South Carolina (-0.4 percentage point each). The District of Columbia had the only significant unemployment rate increase over the month (+0.3 percentage point). The remaining 39 states had jobless rates that were not measurably different from those of a month earlier, though some had changes that were at least as large numerically as the significant changes. 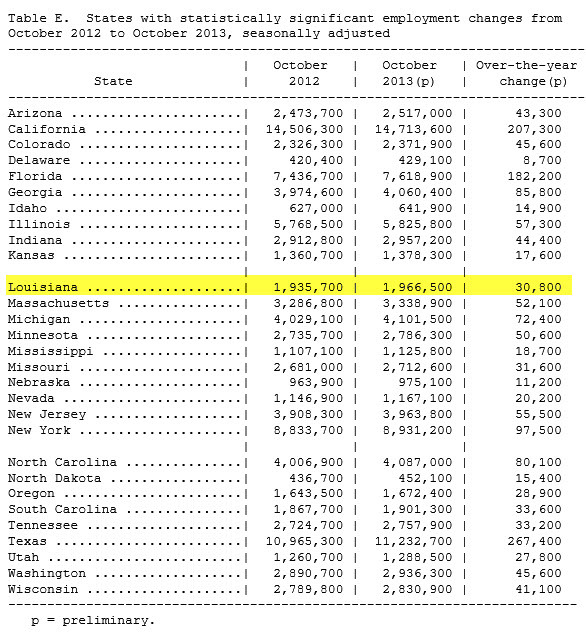 Thirteen states had statistically significant unemployment rate changes from October 2012, all of which were declines. The largest of these occurred in Florida (-1.5 percentage points), followed by California and North Carolina (-1.4 points each). Where Are The Outliers In State Unemployment? The table below shows the states with seasonally adjusted unemployment significantly different from the US for the period ending October 2013. 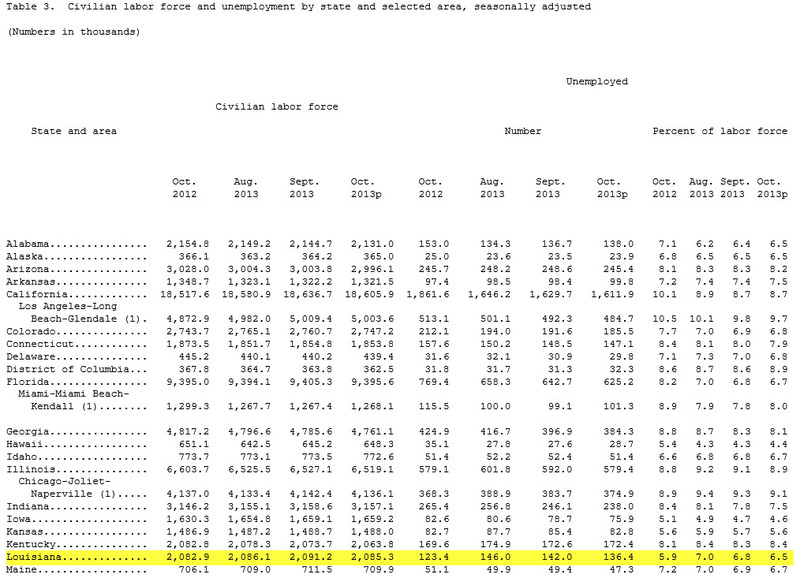 The highest is Nevada at 9.3%, and the lowest is Wyoming at 4.3%, compared to the US average unemployment at 7.3%. Where Are The Big Unemployment Changes? States with momentum the last 12 months are Missouri and South Carolina, both reducing unemployment by 0.4%, as shown in the table below. The preliminary not seasonally adjusted numbers for the October 2013 period show Louisiana has 2,090,700 people in the civilian labor force, and 128,200 unemployed for an unemployment rate of 6.1%, as shown in the table below. The labor force numbers include employed and unemployed people. Make sure you don’t compare crawfish with lobsters, since the Bureau of Labor also reports seasonally adjusted rates. 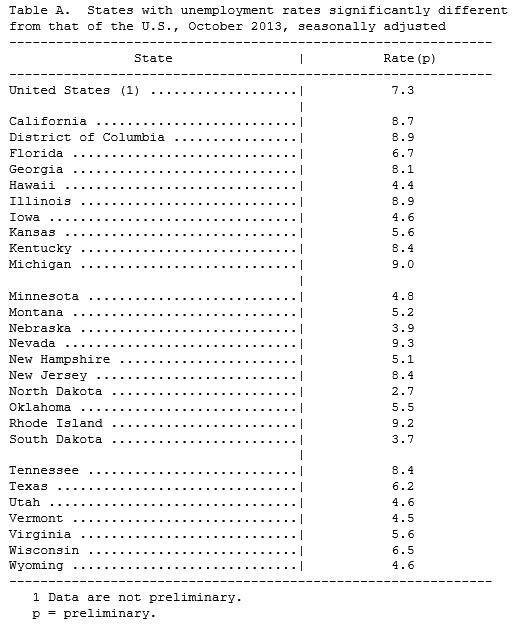 Louisiana has seasonally adjusted 2,085,300 people in the civilian labor force, and 136,400 unemployed for an unemployment rate of 6.5%, as shown in the table below. In summary, over the last 12 months ending October 2013, even though 13,000 more people lost their job, there were 30,800 more people who found jobs. How can that be? 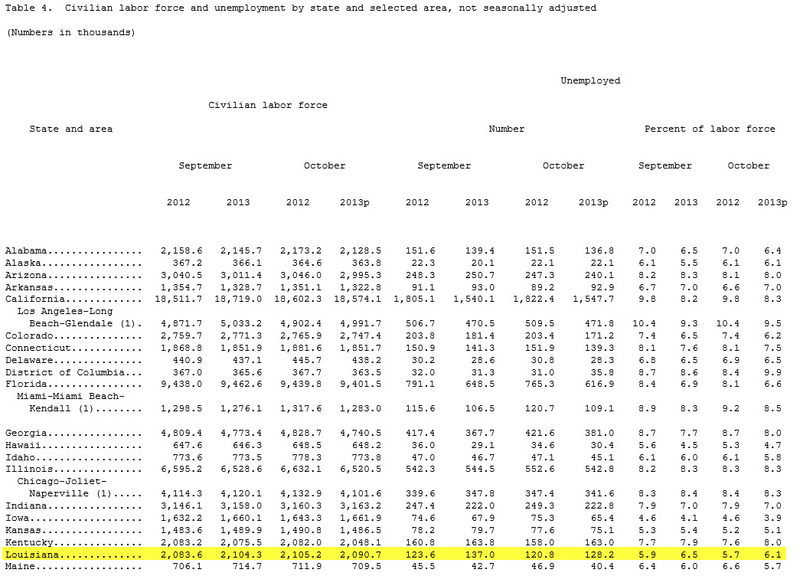 Table E shows the October 2013 employment seasonally adjusted number at 1,966,500 which pulls data from a survey of total non-farm payroll by place of work. Table 3 which shows the unemployment rate changing from 5.9% to 6.5% is data from the local area unemployment statistics program which counts people by place of residence, not jobs. The labor force in Table 3 counts agricultural workers and self-employed, whereas Table E does not count them. So what is the trend? For the period ending October 2013, the Louisiana seasonally adjusted unemployment rate has risen from October 2012 of 5.9% to 6.5%, or an increase in 13,000 unemployed over the last year from 123,400 unemployed to 136,400 unemployed, as shown in Table 3 above.